When it comes to working hard and having fun at the same time, skiing is right up there with one of the best sports you can do to combine the two. Skiing a great way to spend your holidays and it’s also one of the best activities for keeping you fit, healthy and in great shape. When we talk about health and staying in shape, skiing isn’t only great for physical health, but there are also proven psychological health benefits to spending time out on the slopes. Like any sport and motion-based activity, skiing carries several physical health benefits that will be advantageous to your body and physical condition. You might think that gravity does most of the work when skiing, and you’ll just be sliding down the side of the mountain and keeping your balance, but skiing works your body hard. Being on your feet for most of the day, you’ll burn many calories, get your heart rate up and can actually lose weight when skiing. When you ski you are constantly trying to keep your balance and stay on your feet. This engages your core at all times. Of course, this will help to improve your balance and improve your agility and ability to turn quickly. Skiing is one of the best sports for giving your entire leg and lower body a complete workout. You’ll spend a lot of time squatting and moving your lower body, working your thighs, hamstrings, quads and glutes. After your first session on the ski slopes, you’ll know that your legs have had a thorough workout! Here’s a top tip: Help your legs get used to the work they’ll be doing on the slopes by doing some leg workouts at home before you head on your ski trip. Just like buying ski wear to ensure that you’re prepared for the slopes, make sure you legs are ready too for the work you’re going to put them through. Skiing puts good amounts of tension and weight on your knees, ankles and feet, which will strengthen the joints and bones in your legs. This kind of motion and action will also help to prevent knee damage and osteoporosis, keeping your bones and joints in better condition for longer. The constant motion and stretching required when skiing will help to improve the flexibility and range of movement in your muscles. This will help avoid muscle strains when you exercise back home. Did you know that your body can burn 3000 calories a day when skiing? Skiing will work your body and burn calories. As this happens your body will start to lose weight, helping to keep your body fat down. As we’ve just seen, your body burns a lot of calories when skiing, so refuelling is important. A lot of people skip breakfast, but a good breakfast is a must before skiing. Lunch and dinner are both essential for refuelling and recovery, helping your body to stay in top condition. Vitamin D deficiency is a growing problem, especially as more and more people start to work indoors. 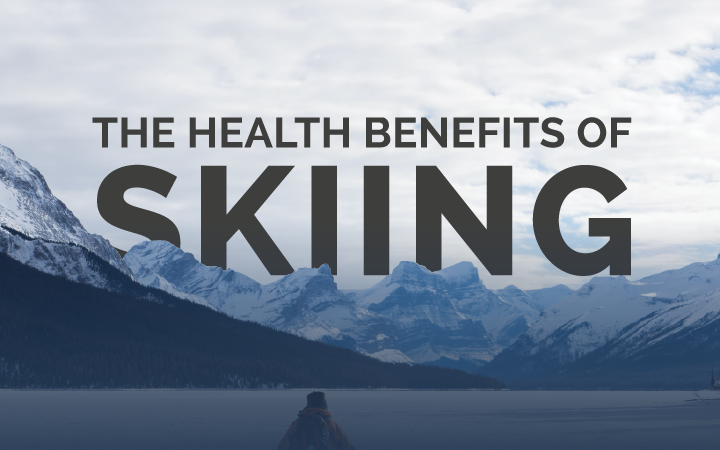 Being outside on the slopes in the sunlight is good for your body, and your mood too. Covered head to toe in ski gear also means you’re getting plenty of sunlight without the risk of being burnt all over! Not only is skiing great for your body, it’s also good for the mind too. Mental health has been a talking point both within sport and society in general in recent times. Taking steps to keep your mind in good condition, as well as your body, will help to improve your overall wellbeing and conditioning. Skiing can actually help to improve your mood and enhance your overall outlook. Studies have found that people who ski come back with a greater sense of happiness and overall well-being. Health and fitness site, Fit Day states the following about the mental health benefits of skiing: “Endorphins and adrenaline are released into the bloodstream [when skiing], elevating the mood and providing an overall sense of wellbeing and contentment. Downhill skiing is a great all-round way to keep both the body and the mind healthy and fit for anyone willing to give it a try.”. Proprioception is a person’s ability to feel the position of different parts of the body and the efforts that go into moving them. As you judge speed, distances and where you need to position your body, your awareness of the space around you will increase. This benefits you physically too, but it starts with your mind and your brain’s ability to calculate and analyse your surroundings. Better Sleep Another factor that benefits both the body and mind, getting plenty of sleep is good for you but something that any people aren’t good at. Skiing will work your body and brain hard, meaning that at the end of the day you’ll be ready a good recharge. Than can lead to your body getting into the habit of getting good sleep. “Exercise promotes slow-wave sleep. It’s a deep, intense sleep from which is hard to rouse an individual. Slow wave sleep is the special component of sleep which makes us feel refreshed and rejuvenated in the morning. It is what gives us a sense of feeling restored in the morning.”Dr. Qanta Ahmed for the Huffington Post. There’s a lot going on when you’re skiing, which not only gives your body a workout, but your mind too. Exercising your mind strengthens it, just like your abs and biceps. I appreciate that you talked about how skiing can strengthen leg and lower body muscles because you’ll spend a lot of time squatting and moving the lower body, which is like giving them a complete workout. I’ll be going on a skiing trip with friends in the weekend, and it sounds like a fun and healthy recreation. Thanks for the tip on getting ready for the slopes by doing some leg work out! That is really nice that skiing improves cardiovascular endurance and health. That is something that I would love to start doing to help my health. Maybe I should do some ski tours or something to better my health. The Best Black Friday Deals: Ski Clothing, Equipment, Flights & more!